Ex Companhia Paulista RSC-3, then just repainted to Fepasa colors. Jundaí shops, 1968. 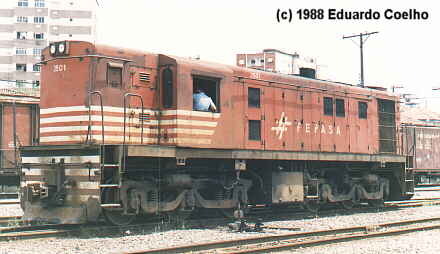 Here is one of the few remaining ALCO RSD-8s operated by FEPASA on its meter gauge lines. The photo was taken in November 20, 1993 in the station of Samaritá, which was the terminus of the suburban service. This particular unit once operated in the suburban service in the city of Santos, pulling carbon steel cars, that was former electric multiple-units, modified with a control car in the oposite end. The locomotives worked in push-pull operation, but, due to lack of maintenance, the service was discontinued. Fortunately, the locomotives were assigned to freight and shunting duties in the Port of Santos. The locos were built originally for the Companhia Paulista for their meter gauge network and were delivered to C.P. in May, June and July 1958 (C.P. had lines of three gauges:1600 mm,1000 mm and 600 mm). The units received road nos. 900 through 909. When this network closed down, the Locos where sold to the Companhia Mogiana, to were they were delivered in January, April and March 1969 and in April, May, June and July 1970. Mogiana used the engines (now numbered 21 through 30) in general service. 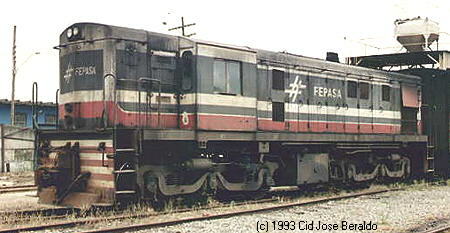 When in the 1970s the separate state systems were consolidated into Fepasa and the locos were transfered to the Santos-Juquiá line where some of them are still operating at last notice.